If you’re new to playing guitar, you might not appreciate pickups like most professionals do. While that’s completely understandable, it would help to at least know a thing or two about pickups if you really want to maximize your guitar’s capabilities and broaden your knowledge about the instrument at the same time. That said, here is a quick guide on understanding guitar picks. A pickup is a kind of transducer, which is a device that turns a physical input into an electrical output, or vice verse. Common transducers include speakers, microphones, and, of course, guitar pickups. A guitar pickup takes the vibration of the guitar string and turns it into an electrical signal that an amplifier can work with and make louder. The two most common types of pickups for a guitar are magnetic and piezo (or contact pickups). There are other, less common, varieties such as optical pickups, but these are extremely uncommon. We’ll start with some general ideas, touch on piezo pickups, and then go in-depth in magnetic pickups since those are the most pertinent to most players. What is a vintage-style pickup? Simply put, a “vintage” style pickup is one that’s built to sound like new pickups used to sound like in the late fifties through early seventies. Usually, they will be lower output and the manufacturing process will often mimic the less precise hand-made aspects of early pickup manufacturing. A good rule of thumb is, the closer to the bridge a pickup is placed, the brighter the tone will be, but the lower the output. A neck pickup will have a lot more bass and tend to be louder. Often, neck pickups are lowered to be farther away from the strings in order to balance the output with the bridge pickup. Acoustic guitar pickups are usually placed in the sound hole or under the bridge, depending on the kind used. Another pickup placement is under the saddle which is why such pickup type is called undersaddle pickup. It sits close to the strings, so it resonates the sounds of the string really well. Output is the signal strength coming out of the pickup and going to your amp. Higher output (hotter) pickups will drive your amp harder and are good for getting a thick, high-gain sound. Hotter pickups will tend to compress your tone, making lead playing easier at the expense of delicacy. 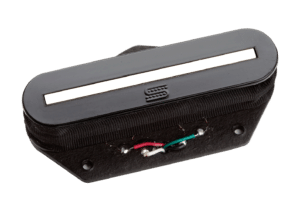 Lower output pickups tend to be more “open” sounding with a less hyped frequency response and will respond more to the way you’re playing. Most players gravitate towards a happy medium that doesn’t require a ton of gain at the amp to get a good sound but also does not compress their tone. Piezoelectricity is the creation of a current due to a change in pressure. In a guitar, the piezo elements act as contact microphone and are placed under the bridge of an acoustic or electric guitar. They are ideal for an acoustic because they can be mounted unobtrusively and don’t require the strings to be magnetic. When used in an electric, piezo pickups are usually there to help simulate the tone of an acoustic. Piezo pickups won’t pick up electromagnet interference but can be vulnerable to feedback, especially in a larger acoustic instrument. They have a very clear tone that can border on “quacky” if not EQ’d properly and they are very responsive to touch; strumming hard will produce a lot of output through a piezo pickup. They do require a preamp, which means you will need a battery if you want to use the pickup. The upside of that is an acoustic payer gets a lot of control over their sound once they plug in. A magnetic pickup works a lot like an AC generator. There is a magnet that is wrapped with thousands of turns of very fine copper wire. 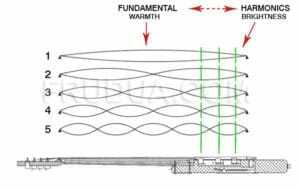 When the steel strings of an electric guitar move or vibrate near the pickup, the steel interacts with the magnetic field and induces a current in the wires wrapped around the magnet. That current takes the shape of the sound wave the strings produce and runs out of the guitar and into an amplifier. 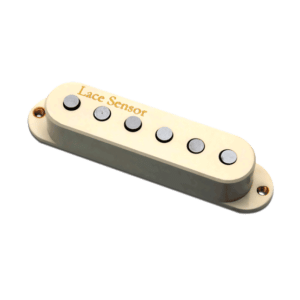 The basic factors that go into determining a pickup’s sound are the kind of pole pieces used, the material the magnet is made out of, how many coils there are, the number of wrappings on the pickup, and whether it is active or passive. All of those factors work together to influence both the output of a pickup and its tonality. Alnico is a magnetic combination of aluminum, nickel, and cobalt (Al-Ni-Co) and has been used in guitar pickups since the earliest days of manufacture. Alnico magnets have a variety of compositions and are graded depending on the percentage of each element present. However, most pickups you will run into use Alnico 2, Alnico 5 or ceramic magnets, but other formulations of the alnico alloy are sometimes used. Alnico II – Low output. This is the vintage choice, known for its “sweetness,” bright clean sound, great highs and resonant lows. It lacks a bit of midrange, however. Alnico III – Low output. There’s a bit more response to the upper mids than II, but at the expense of the low range. Alnico IV – Medium output, and characterized by a flatter tone and a very natural sound. Alnico V – High output. Alnico V has a great mid-range with softer lows and mild highs. Ceramic –Ceramic magnets produce a clear, crisp sound that is often a bit more compressed. At their best, they can be incredibly full and clear. At their worst, they sound harsh and brittle. Wrapping is the process of coiling a copper wire around the magnetic parts of the pickup. The number of wraps impacts the sound and output of the pickup: more wire means higher output and generally less treble. There are different ways of wrapping the wire, from neat rows to wildly scatter-wrapped pickups. Additionally, the two coils of a humbucker can be wrapped systematically or asymmetrically, each yielding a different sound. Today, manufacturers have their wrapping technique dialed in so that each model they make gets exactly the style and number of wraps needed to produce the sound they’re after. 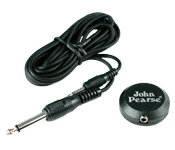 Passive – Passive pickups require no power to operate other than the voltages generated by the pickup itself. In order to get high outputs, a lot of wire must be used, which tends to change the frequency response and introduce more noise, even in humbuckers. Some players feel that these compromises are part of the “organic” sound of passive pickups, and even high-gain passive pickups tend to have a good dynamic range and respond well to player touch. Active – Active pickups need a battery-powered preamplifier to work. They are usually built like a weak passive pickup and rely on the preamp for their high output and extremely quiet operation. Because of this, they usually have a full, even response and can really push an amp hard. 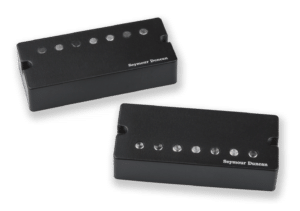 A lot of metal and hard rock guitarists prefer these pickups because they can really drive their amps and have a great signal-to-noise ratio. Depending on the preamp, they often sound a bit compressed, a trait some players love and others hate. For every player that loves the crisp, cutting tone of an active pickup, there is another that finds them to sound dry and sterile. Pole – The most common design uses an individual pole piece (or, in the case of typical Fender single-coils, the poles are the actual magnets) for each string on each coil. The advantage is that each pole piece can be a different height, thickness, or even magnetic material to suit each string. Some designs allow for height adjustments on the pole pieces as well. Also, note that wider the pole, the wider the magnetic field it produces which will ultimately give off a richer and more complex sound. If you intend to produce a brighter tone with more twang, a narrow pole with a focused magnetic field is preferable. The downside is that the pole pieces have to line up just right with the strings to produce their best sound. Because of this, there can also be a reduction in output when you bend a string. Some designs compensate for this by having more, smaller pole pieces per string, but these are less common. Blade – This design uses a single “blade” (thicker “blades” are often called “bars”) in place of individual pole pieces. An advantage of this design is that the sound is consistent from string to string, and there is no output drop if you bend a string. Blade pickups are often associated with heavy metal, but not all blade designs are meant for heavy music. Guitarists like blades because there is no drop off when bending. Because a thick bar is larger than six small pole pieces, it’s possible to have more power with this design. The downside is they are not very adjustable and the response of the pickup cannot be tailored to individual strings the way a pole piece design can. They are also not very traditional looking, which is a sticking point for a lot of players. Single Coil Pickups – A single coil pickup is exactly what it sounds like; it uses a single pickup coil. There is just one set of magnets and wire. These were the only style initially. Although, a guitar can have a few sets of single-coil pickups like the one on the classic Fender Stratocaster which has 3 of them. This unique feature earned them the name strat pickups. Single-coil pickups are known for delivering a very bright and crisp sound with a lot of treble and a great distinction between each note. These qualities make them very popular for styles of music that don’t use a lot of gain, like blues and country. A lot of classic rock players also like them because single coil pickups are the original sound of rock and roll. The downside is that they pick up a lot of unwanted noise from the environment, which can be anything from a nuisance to a complete disaster. 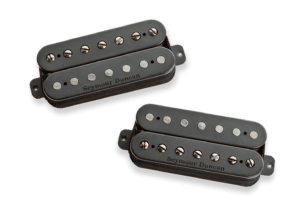 Double Coil Pickup (Humbucker or Humbucking Pickups) – In essence, a double coil pickup is a pair of single coils wired together in such a way that the noise from the environment is canceled out without harming the output of your guitar (they “buck” the hum). Thus, the name humbucking pickups. 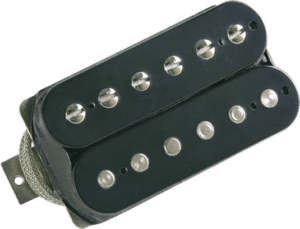 Due to a number of factors, humbuckers tend to be louder than single coils, with a fatter, “thicker” sound that comes from a reduction of the treble response and the higher output. Jazz players like their smooth sound, while heavy metal players love their high signal-to-noise ratio and heavy, thick sound. How to Install Guitar Pickups? Once you’ve chosen your desired pickups, it’s time to figure out how to install them on your guitar. The steps should be slightly different depending on the type of guitar. But, here are some of the general things you should go through. First, you need to remove the plastic plate that’s covering the control panel. Use the appropriate screwdriver to do so. Once the cavity and the wirings are exposed, take a picture or at least note where the wirings go. Then, remove the solder to pull the wires apart. You may need to remove loose strings at this point or simply take out everything and replace them with a new set. Now, you can remove whatever pickup you have on your guitar. Remove gently. Refer to the wiring diagram that came with your new pickup and solder the wires in place. Once the pickup is in, take the plate again and screw it back on. Test your guitar to see if you’ve messed up any of the wirings. The simplest way to do it is to clean a guitar pickup is to wipe any gunk or dirt off the pickup with a clean, soft cloth. You may or may not take out the strings during the process. The important thing is not to apply any cleaning fluid which can potentially leak into the windings and cause damage. At the same time, avoid using any ferrous materials like steel wool to get rid of rusts. The metal pieces of the steel wool can get stuck in the pickup’s magnetic parts which can ultimately affect the way it functions. Speaking of rust, believe it or not, but a lot of people actually pay quite a hefty amount of money just to get their pickups aged. That said, the rust itself is not necessarily a flaw on the pickup’s part. In fact, it gives the entire guitar a vintage look that many clearly appreciate. As long as it doesn’t affect the sound of your guitar, might as well just leave it alone. Like everything else with guitars, knowledge comes from experience and the best way to figure out what works best for you is to experiment with your sound and various pickup combinations. Swapping out pickups is one of the easiest ways to customize your instrument, and often the quality of the pickups is the biggest difference between the mid-range and high-end instruments of a given guitar maker. Fortunately, it’s easy to go to a guitar store and try out many guitars with many pickup combinations before you decide what you might like to put into your guitar.